This is likely the most unusual antenna design you’ll find anywhere. It’s a product of my experimentations with loop loading that I was conducting approximately a decade ago. In this particular case, I was looking to see if it was possible to have a very short dipole demonstrate good radiation efficiently plus a respectable bandwidth. The “Galaxy” dipole not only met that criteria, it provided a most useful bonus as well. I’m not sure whether to say this dipole is omni-polarized or it just simply has no definitive polarization. Whatever the case, one of the most interesting aspects of the “galaxy” dipole is that one can tune it, say, on a pair of sawhorses on the ground, and the tuning will hardly change when it is elevated high above ground. Similarly, one can place it adjacent to wires and metal poles with equal results. In other words, it does not– to any significant degree– interact with the ground, or nearby metallic objects or wires. I suspect this is so because the antenna has no straight wires, lumped inductances, or a well defined polarity with which to induce mutual coupling or strong ground currents. Since the radiation from this antenna is unlikely to load, by any great amount, into the network of wires, electrical conduits, etc., that are usually found in one’s attic, this could prove to be the best little attic dipole ever, as very little of its radiated energy should get absorbed by its environment. The “galaxy” dipole consists of approximately 50Â½ ft. of copper wire that is formed into a series of sinusoidal waves that become progressively smaller (or larger, depending upon the direction). A greater portion of the wire is twice folded back on itself in each half, with its waves occurring in both horizontal and vertical orientations to form a shape that is somewhat reminiscent of a series of spheres that have progressively smaller circumferences away from center. The end result is an electrically resonant dipole that is about Â½ normal length that employs no lumped L or C or LC constants. A prototype was made of #12 solid copper wire using two joined 8′ lengths of 1Â½” PVC tubing as a support structure. Holes, in groups of four, are drilled through the PVC tubing (two vertical and two horizontal) at the specific points along its length where the wire waves will cross (and pass through). These holes are necessary in order to maintain wire position and wave-shape, and must be drilled slightly offset to prevent shorting between the crossing wires as they pass through. The tubing sections are joined in the center with a 4-way sleeve in which short vertical sections of PVC tubing are inserted to support the top and bottom of the large center loop and feed-point. In retrospect, square fiberglass tubing would likely be a much better choice of material. The numbers shown in the drawing below describes the length of each wave, and wire directions are color coded in an effort to illustrate the continuity. Short (3 to 6 inch) stubs are added at points A and B to allow some adjustment of the resonant frequency and feed-point impedance. This is accomplished by modifying the stub lengths as suggested. It is highly recommended that a 1:1 balun be employed at the feed-point (FP) to suppress common-mode feed-line radiation. Although no calibrated field-strength comparisons were made, on-air transmit/receive tests suggested the VSWR bandwidth and overall performance was consistent with a full-sized dipole. 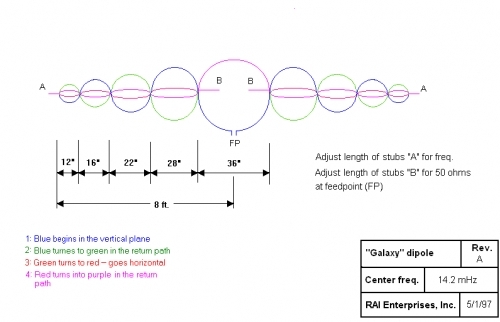 It seemed he “Galaxy” dipole gave slightly better performance off the ends than was expected. For other bands, simply scale the dimensions accordingly.